No, this is not a message about drunk driving, nor do I support drinking while driving. But if you haven’t watched the movie The Silencers starring Dean Martin, you are missing the greatest Ballantine’s advertisement that probably ever ran in 1966. 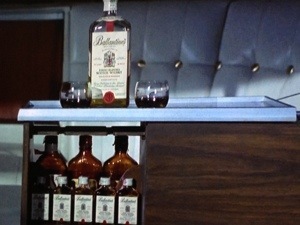 Dean and Stella Stevens are en route and Dean activates his “car bar” which brings out a nice assortment of Ballantine’s whisky. I’m a big Dean Martin fan but the point of this post is the whisky itself. About ten years ago at a friendly gathering I was offered up the usual “what would you like to drink?” by gracious hosts. The gentleman was an avid scotch whisky drinker. At the time I was strictly a clear whisky guy. I’d drink vodka and gin and occasionally bourbon. My last encounter with scotch whisky was many years ago in college and I didn’t think I would ever enjoy scotch whisky. The gentleman said to try it with ice, just three cubes, and the rest is history. From Ballantine’s I jumped around and ran the usual Johnny Walker/Dewars route common in The States. Then I started playing with single malts and away I went.